AD Consultants of FirstAttribute support projectsfocussing on Identity Management and Migration in the area ofMunich. For several years, FirstAttribute supports Munich-basedcompanies and enterprises in the field of Active DirectoryManagement and Identity Management. In many cases Active Directory is the starting point for theoptimization of Identity Management. Several Munich-basedenterprises already use additional tools of FirstAttribute for theIdentity and Permission Management. A special development in this field is an Active Directory basedsystem for the management of the companywide organization. Active Directory Consultants in Munich assistthe development of this project. The system is in use to manage theaccounts of more than 10.000 employees 100 subsidiaries.Applications and other systems can directly access the relevantinformation through this system. Our IT Consultants support the project management, planning andrealisation of AD consolidations all across Germany (andEurope). 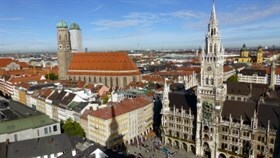 Customers inthe Munich area are mostly companies in the Logisticssector and Service Providers. If you want to know more about our products and services, we arehappy to get yourmessage.